KELSO — The Mountain View Thunder had a perfect third quarter to end Kelso’s perfect season Friday night. 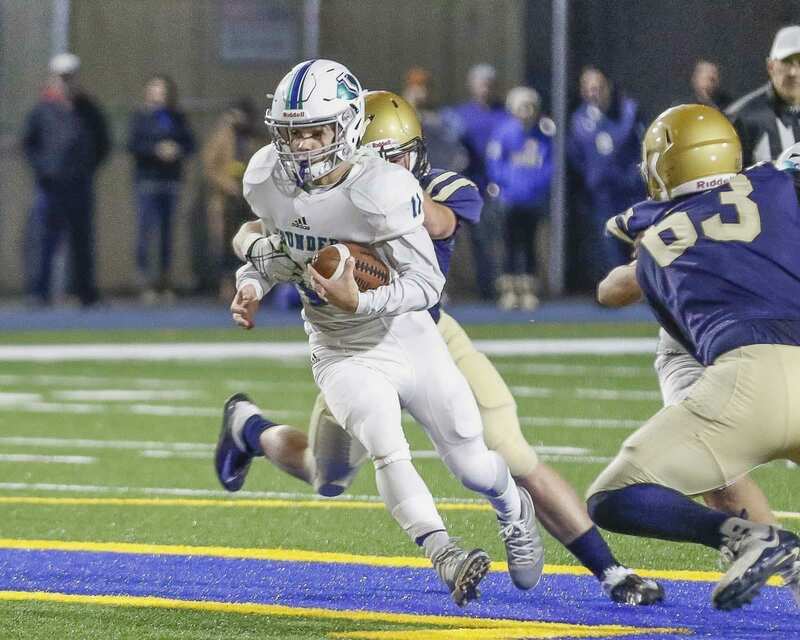 In a flash, a close game turned into a blowout, and the Mountain View Thunder claimed the Class 3A Greater St. Helens League football title. 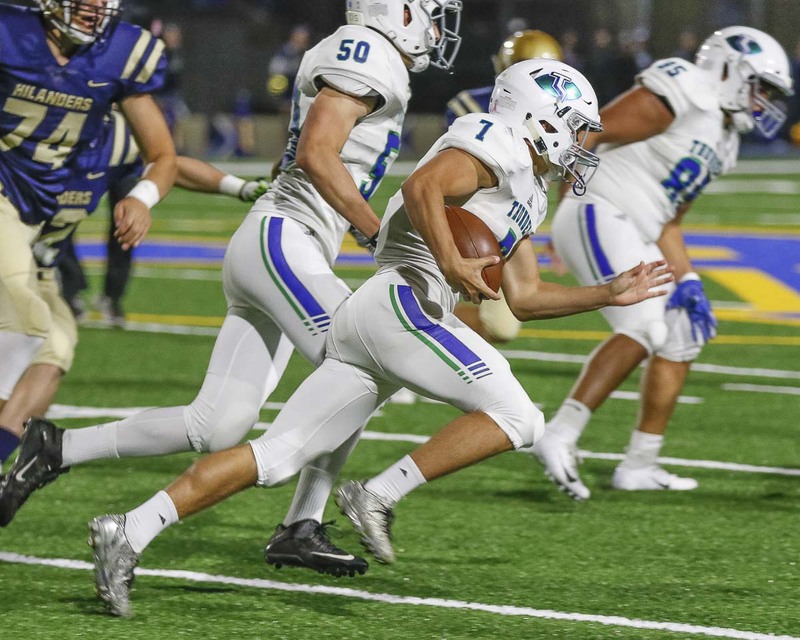 Philip Earnhardt scored three touchdowns, the Thunder got two defensive touchdowns, and Mountain View made the title game a running clock with a 49-7 victory over the Hilanders. The Thunder improved to 7-1 overall and 4-0 in league play with a game against Fort Vancouver next week. Kelso fell to 7-1, 3-1 in league play. 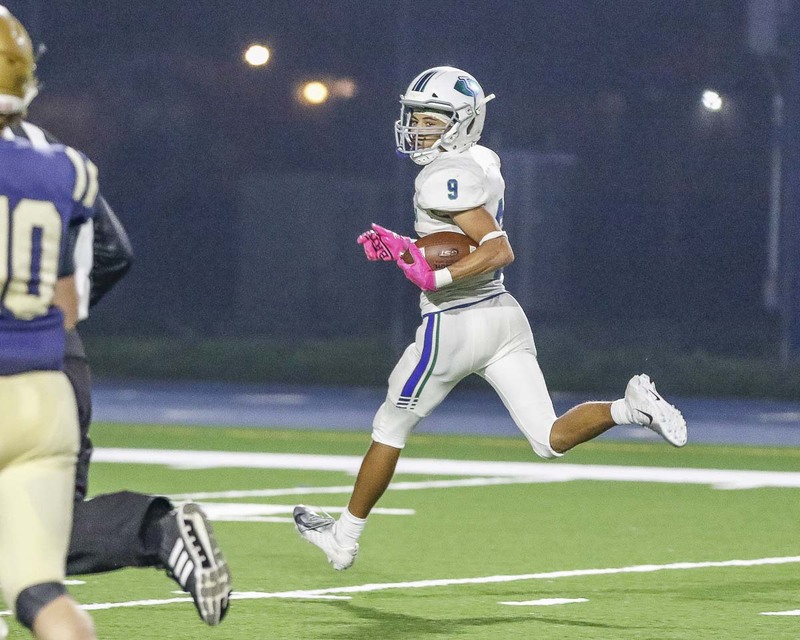 Mountain View clinched the league’s top seed to the Week 10 state preliminary playoff game. This was the team’s third consecutive league title. How they did it will be talked about for years. This was not just for the 2018 squad. This is for all the Mountain View teams in the past and in the future. “We’re Team 38. This championship is for Team 100 and for Team 1,” Remlinger said. After a 7-7 first half, the Thunder needed six plays to take the lead on a Garrett Moen touchdown run. Three plays later, it was 21-7 when Alec Cann intercepted a Kelso pass and returned it 28 yards for a touchdown. Once Mountain View went up two scores, the Thunder went for the kill. Earnhardt would make it 28-7 on Mountain View’s next possession with a 7-yard touchdown run. Just 14 seconds later, Jack Mertens had a pick-six, this one from 21 yards out, and the Thunder had a 35-7 lead. Earnhardt would catch a bomb from Moen for an early fourth-quarter touchdown. Mertens capped the scoring with a 14-yard touchdown run with seven minutes to play in the game. In 17 game minutes, it went from a tie game to running clock. Earnhardt scored on a nifty 4-yard touchdown run, breaking three tackles to get into the end zone for a 7-0 lead midway through the second quarter. Kelso tied the game when Riley Noah blocked a Mountain View punt, then scooped and scored from 33 yards out. Neither team had more than 100 yards of offense in the first half. Then it was all Mountain View in the second half. The Thunder held Kelso to 146 yards of offense, plus had the two defensive touchdowns. Remlinger was one of several Thunder players to make a difference on defense with several tackles for loss. Remlinger said the defense did not need to make any adjustments at halftime, but the offense switched up a few things. Some 42 points later, the Thunder were on their way. RUSHING: Mountain View — Mertens 17-144, Moen 6-24, Earnhardt 3-14,Bobby Shepard 4-12, Xavier Mayo 2-4, Malikiah Batties 1-3. Kelso — Josh Webb 17-52, Dillon Davis 1-(minus 2), Marshall Coleman 14-29, Nate Lonner 1-2, Noah 1-(minus 2), Jayden Hardeman 1-9, Blake Fowler 1-0, Gage Bloomfeldt 3-20. PASSING: Mountain View — Moen 7-15-0-142. Kelso — Coleman 7-12-2-38, Kyle Broxton 0-1-1-0. RECEIVING: Mountain View — Earnhardt 1-68, Makai Anderson 3-37, Michael Bolds 2-25, Rodolfo Montiel 1-11. Kelso — Noah 3-23, Hardeman 2-(minus 2), Webb 1-22, Davis 1-(minus 5).